Sam would have liked to put in his elk application with bull as first choice, and cow as second choice, but since juniors-only elk tags still cost about half of what a regular elk tag costs, and I’m paying the tab, juniors-only hunts is all he gets for the time being. The juniors hunts are all antlerless elk hunts. 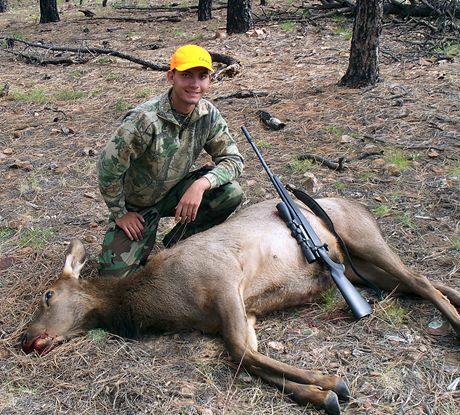 Sam took his first elk a couple of years ago in unit 6A on a juniors-only hunt. He received another 6A elk tag last year, but mechanical breakdowns and missed opportunities conspired to send us home with his tag unfilled. For this year, we decided to put down unit 6A as second choice. For first choice, we entered the hunt number for the unit 3A/3C juniors hunt. This is an area that we had never hunted before. We decided to make that first choice just for the chance to try something different. Sometimes, you just get bored hunting in the same place over and over, especially if your last experience in the old place was less than successful. When the draw results came out, yup, he was drawn for 3A/3C. As it turns out, 3A is a marginal area for elk in mid-October. It may be fine winter range because it’s lower country, juniper and sage, but 3C is where the elk would be for Sam’s hunt. Unit 3C runs on top of the Mogollon Rim from Forest Lakes in the west, to Show Low in the east, to Snowflake in the north. Highway 260 runs through the middle. The prime elk country though, is the area south of Highway 260 to the border of the Apache Indian reservation. Starting with two entire hunt units, we’ve already whittled the possible hunting area down to maybe 1/4th of the alotted area. But wait, there’s more … Almost 100% of this prime elk area was involved in the 2002 Rodeo-Chediski fire. 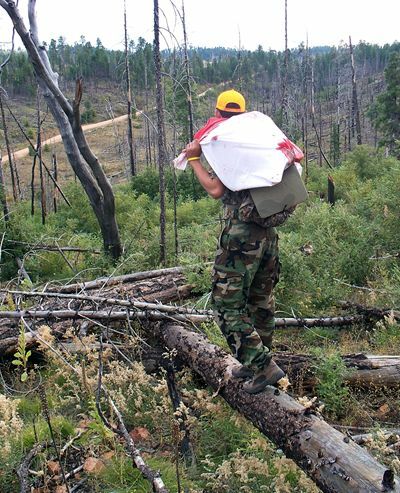 We would be hunting in the burn area of Arizona’s worst-ever forest fire. We got a chance only once in the summer to get up to the area to scout for elk. The three us, myself and the boys, Ben and Sam, headed for an overnight scouting mission about to the middle of this thin slice of what was supposed to be the best area for elk. We found very few mature trees left. There are many dead picket posts still standing, but some new growth is coming back. The new trees are but the height of a man and less. If you get up on a high spot you can see for a great distance due to the barren slopes. The slopes are devoid of large living trees, but they are green nonetheless due to plenty of green grass and new low shrubby growth. It has been eight years after all. After two days of looking around, we saw no sign of elk. No tracks, no droppings – enough to convince us that we weren’t going to hunt around here. After all, that’s what pre-hunt scouting is all about. Not only to find out where to go, but where not to go. Well that’s fine, but we still did not have a plan for the hunt. Where we went, we were in the 6,000 to maybe 6,800 foot elevation level. I reasoned that we would need to be up in the 7,000-foot-plus elevation level. The hunt was coming up fast and we never did get a chance to head up for a second scouting mission. Instead, we would have to rely on “desktop scouting.” In days gone by, that would mean scouring topo maps and maybe even aerial photos. I’ve done my share of that. But today, the very best tool is Google Earth. Oh, I still use topo maps, but on the computer instead of paper. But Google Earth is an absolutely amazing tool. You can view the land as if you were hovering over it in a helicopter! You can get real low and close, even float through the canyons. No, it doesn’t show you the elk running away from your virtual flying machine – not yet! 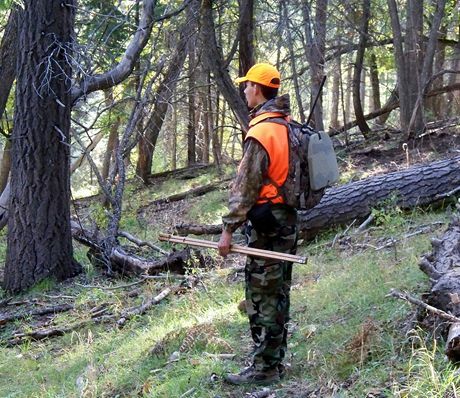 A pre-hunt scouting mission has at least three goals: 1) find evidence of game to give you an idea where to start your hunt; 2) learn the roads in the area; 3) pick a camping spot or two. With Google Earth, goals 2 and 3 can actually be well accomplished. Goal 1 cannot be accomplished directly. But by studying the topography of the land, the elevations, and by observing the relationship of the vegetative cover to the topography, one can make informed guesses as to which folds in the land probably carry game. So when the weekend of opening day rolled around, I had identified a likely looking area to hunt at the 7,000-plus-foot level, and had picked out a camping spot that we would head for, even though I had never been there before. OK, I will admit that I had driven the main road through the area once before, but not to the particular open spot next to this particular forest trail where we would camp. Sam and I arrived mid afternoon on the day before opening day. The spot chosen had not yet been occupied, though there was a pretty big camp that we passed on the way in and not too far from our spot. We had camp set up in about an hour after parking, ready for a week’s hunt. As evening fell, we enjoyed an easy dinner of chile from the can, plus crackers. We then headed for the truck where I had my laptop computer set up with the topo mapping software. We discussed a plan for opening day. Behind camp, a nice canyon started. Near camp at the head of the canyon, the burn had not done too much damage. Starting less than a half mile from camp, down the canyon and down the ridge our camp was on, the burn had indeed taken its toll. Our plan was to get down into the bottom and start hiking down the draw at first light. And that’s exactly what we did. In some spots, the cover was too thick for stealthy travel, so we would cross over to the opposite slope. We didn’t walk straight down the bottom, rather we walked along on one side slope or the other. After maybe an hour of slow stalking, we found an obvious bedding spot. The ground was kinda soft and churned up, but it was the barnyard smell that gave it away. Soon after that, we came upon an elk carcass. As we continued stalking down the drainage, we started hearing bugling further on down the canyon. It became louder and then almost constant. We asked ourselves whether that was really elk, or was it a hunter who didn’t know when to shut up. We would soon find out that it really was elk. We reached a point where a side canyon joined the draw we had been walking, from our right. In front us, a ridge rose, as the canyon took a turn to the left. We had come to an area where the fire had reached to the canyon bottoms. The slopes around us had opened up, and before us was lots of low green growth amidst a tangle of downed logs. The sound of the bull bugling continued down-canyon to our left. We stopped here briefly to eat some granola bars and figure out our next move. We decided to continue heading in the direction of the vocal elk. But as we finished our snacks, we heard a different sound. We heard some cow elk mewing. We looked up to the top of the ridge in front of us and Sam said that he saw some cows. I definitely saw movement between the dead standing trunks and amongst the low green growth near the top of the ridge, but I didn’t see enough to identify the movement as elk. I had a diaphragm turkey call in my pocket. I did my best to make the call sound like mewing cow elk. Sam got set up to shoot, and we thought that they started to come toward us. After a couple of minutes, we saw no more movement. The decision was made to head to the top of the ridge to see if we could catch up to them. I followed Sam up to the top of the ridge. Though the slope we had climbed had a lot of green low growth, the top of the ridge was bald. We thought the direction of travel of the two elk was from left to right along the axis of the ridge. We looked off in that direction, up ridge, but saw no critters. To our left, the ardent bugling continued in the direction that the ridge plunged back down into the canyon. Moments later, Sam again detected movement – on the next ridge in front of us. 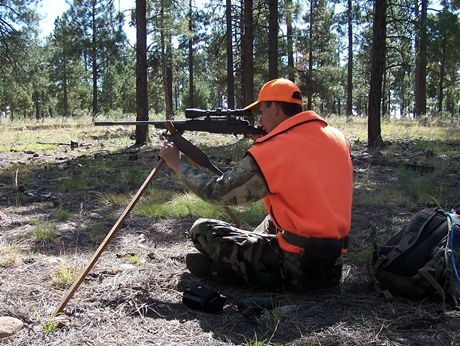 We pulled up binos and rangefinders and focused them on the next ridge. This herd was about 400 yards away. They were milling around a bar of bare earth. Between us and them was another drainage that we would need to cross. If we were to descend to the left, we could meet a nice ramp at the bottom which would take us up to them. After executing this plan and reaching the top of this ridge, again the elk had given us the slip. We discovered that the “bar of bare earth” was the berm of a small water catchment. Our overall plan for the morning was to head toward a tank that was shown on my handheld GPS unit in the bottom of the main drainage. This tank was shown as being about a mile and-a-quarter from our camp in a straight line. We were now on top of the main ridge that our camp was on, but about ¾ miles away. We decided to continue walking down the top of this ridge heading in the direction of the tank at the bottom. When we had reached a point now a little over a mile from camp, Sam once again detected elk in front of us and slightly down off the left edge of the ridgetop. I urged him to sit down, and I did the same a few yards behind him. Nothing scares critters more than the silhouette of a standing man, but I knew that a sitting man is much less fearsome, sometimes even a curiosity. I pulled out the diaphragm call again and started mewing. Sitting behind Sam, I did not have as good of a view as he had. I could make out two elk bodies. After a couple of minutes, I could identify them as two spike bulls. Sam and I were able to whisper to each other without alarming the elk and he told me that he could see more than just the two that I saw. We ended up sitting there for around 15 minutes. I kept up the cow talk for most of this time. They continued to mill around, at times looking directly at us. One of the spikes got momentarily alarmed and started to trot away from us after issuing a couple of “barks”. However, that did not affect the other herd members, and soon he had turned around and was back to his normal routine, with a couple of glances in our direction at times. Sam had his rifle up on the shooting sticks for most of this time. He knew that there was at least one cow, maybe more with the spikes, but they were further down the roll of the slope. I counseled, “Patience …”. Soon one cow started coming up and toward us. The trouble was that she was facing us head on. Sam was not comfortable taking such a shot. But soon enough, she turned broadside, and stood clear of the spikes. Sam fired. Sam was hunting with his brother’s Browning A-Bolt .30-06 Composite Stalker. Originally equipped with a BOSS muzzle brake, it now wore a BOSS-CR. The BOSS-CR is basically a BOSS without ports. CR stands for “conventional recoil”. It still acts as a tunable barrel weight, but not as a muzzle brake. As Sam’s “guide”, I did not want to be subject to the terrific blast and noise that a standard ported BOSS generates. We worked up a load using the 168 grain Barnes Triple-Shock X-Bullet at 2800 feet per second. There was little apparent reaction to Sam’s shot. We knew that she was hit. She stumbled a little and walked back and forth. Sam whispered, “Should I shoot again?” I said, “Well she’s still standing – heck yeah!” Kaboom! Again, she hunched up only slightly as the second shot struck. But less than a minute later she was down. We high-fived and just sat and chilled for a couple of minutes. We measured the shot at around 75 to 80 yards. Sam was still shaking from the excitement of the 15 minute long encounter. The time was around 10:20 in the morning. After approaching and verifying lights-out, we snapped the trophy photo and got to work. Sam generally knew how to proceed and needed only certain points of guidance from me. At times, I jumped in and helped, but most of the red work was done by Sam. We were on top of the main ridge that led back to camp. The maps showed that this ridgetop had a road along it. Well maybe it once did, many years ago. Leaving Sam at the elk to defend against scavengers, I started walking back to camp along the very faint evidence of a road, to get the Polaris Ranger. For most of the way, it looked like I could wiggle the Ranger around the downed timber to get back to Sam and the elk. But about half-way back, the downed logs got so thick across the trail, that I knew I was not going to be able to get wheels to the elk. When I got back to camp, I entered the elk’s coordinates into the topo map on the computer. I found that the main road passed sort of close to the elk, below the ridge. I grabbed the game cart and a pack frame, and threw them into the bed of the Ranger. I also grabbed the large elk bags, a couple of MREs for lunch, and a couple of bottled drinks and tossed them into my pack. I had to drive the Ranger about 4 miles along the main road, around a number of canyon heads, to be able to get the ATV to within about 3/10ths of a mile to the elk – the best I could do. To get to Sam and the elk on top of the ridge, I had to climb up a thick steep slope with more downed logs all over it. I strapped my daypack to the pack frame and set off. It was now about 1pm. Without a stop to refuel, we’d be in bad shape to finish the rest of the work that needed to be done. So I pulled the field rations and the drinks out of my pack and we chowed down. We had never quartered an elk before. We had watched game processors do it with the benefit of electric hoists and electric saws. We had also watched a web video of the “gutless” process to field dress an elk. So we knew the basics. Now would be the first chance to put our theoretical knowledge to practice. We both had our Browning field dressing knives. These are three-inch three-bladed folders with knife, saw, and guthook blades. We also had two elk-sized, high quality game bags. These are not the cheese-cloth bags, rather they are the heavy duty cotton bags. We had to cut each of these bags in half, which gave us four bags for the quarters. Well, we got the job done. The hind quarters were the heaviest. We strapped those onto the pack frame. 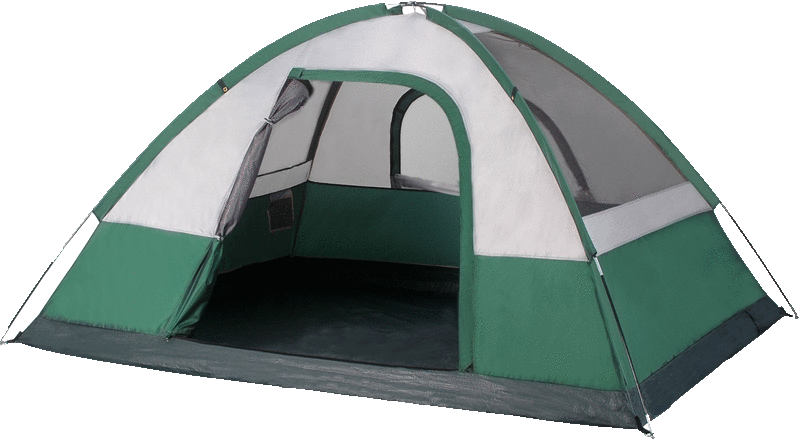 The fore-quarters were lighter and we were able to pack those down to the Ranger “Santa Claus style” over our shoulder. It took us three trips up and down that slope. On the first trip, Sam strapped on the pack frame and I did the Santa Claus thing. On the second trip, we reversed. Once we had the four quarters down at the Ranger, we consolidated the front quarters into one bag and made one more trip up and down to bring down the head and neck. We finally got all the meat back to camp around 6pm. What a day!